Notification Regarding "OCTOPUS CITY BLUES"
Thank you for your continued patronage of GHOST IN A BOTTLE's[ghostinabottle.com] products and services. Two weeks ago, the latest title in the OCTOPUS CITY series, "OCTOPUS CITY BLUES" was released on STEAM GREENLIGHT. Thanks to the support of fans around the globe this revolutionary simulation is now over 50% of the way to GREENLIGHT's top 100. We greatly anticipate and deeply appreciate your ongoing support for the OCTOPUS CITY brand. Please continue to spread the word to ensure that all STEAM users can safely indulge in OCTOBLOOD. Users will be able to experience new emotions such as waiting for the Centipede train to arrive, or vengefully stepping on innocent dung beetles. If you haven't tried the demo already, you can grab it on http://ghost-in-a-bottle.itch.io/octopus-city-blues. To learn more about the world's first authentic Octopus City software, check out the official website[www.octopuscityblues.com]. Armed with this knowledge, you may embrace the unknown and fulfill your destiny. Tell your homeless friends about the simulation. Tell your ungrateful cyborg son. Tell the lingering shadow of doubt that haunts your dreams. Say goodbye to your aging mother. Bury your first toy without looking back. Close your weary eyes and enter humanity's last bastion. Enter OCTOPUS CITY. The Ghost in a Bottle Zaibatsu is pleased to announce Octopus City Blues, the authentic Octopus City simulation. 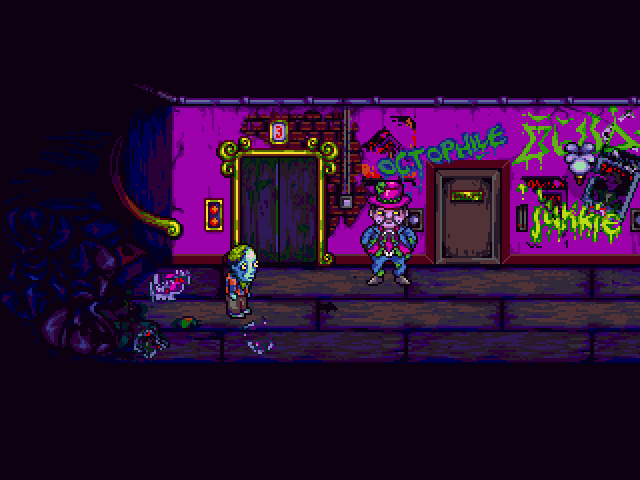 For people unacquainted with Octopus City simulation genre, the simulation resembles adventure games of yore, immersing players in a fascinating setting filled with unusual characters. We place special emphasis on exploration, replay value and the consequences of choices. Any more news? im so excited to play it. An aprox realease date? please? I can't wait to play that fucker. I have been looking forward to this game for months, since 2014, possibly over a year.I hope it comes out well! The pixel art is awsome! Great god. The graphics are so bloody AMAZING.